What you'll get in this article on American author and speaker Byron Katie is deep and fairly controversial. You'll get powerful insights into what we all desire: how one may live in total peace and love - and consequently how such a mindset may spill over into your parenting life. But first, who is she? (And sorry, there is no easy way to answer this). Byron Katie is a very special woman ... except that she probably wouldn't even call herself a woman (a gender category) or Byron Katie (a name) or special (a term of indicating that something is better than something else). In fact, she probably would say that she is nobody or that she is everybody. The only reason she would say that she is a woman called Byron Katie would be to speak in way that we would all understand. And to speak in a way that we all understand, would in her world be kind and showing understanding which is a way she has chosen to live - always and without compromise. Because it hurts her not to! It's really very, very simple. It doesn't feel nice to her when she's not kind. And this she takes very seriously. If I'm kinder, I'm making a measured difference. That is your contribution to peace, even if you're not aware of it. I don't like me when I'm not experiencing my true nature which is love. 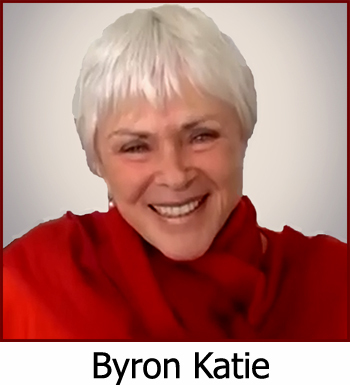 So Who Is Byron Katie? - Someone Who Never Suffers Anymore! 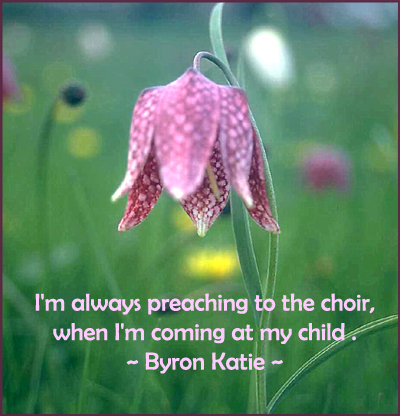 Some people would say that Byron Katie is a spiritual person. However, Byron Katie doesn't see herself that way. She merely sees herself as someone who knows the difference between suffering and not suffering or between what hurts and what doesn't hurt. Something she has learned the hard way (which you will read about further down). Byron Katie says that she only has one job to do here in this world and that that is to teach people how to end their suffering. In more formal terms, Byron Katie is an American author and speaker and is the founder of a self-enquiry method she has called The Work. The Work consists of four questions and what she calls a turnaround. The Work is aimed at identifying the thoughts that cause stress and suffering, questioning those thoughts - are they true? - and turning them around to something that sounds more true to you than the original thoughts. (I know, it sounds a bit esoteric without more introduction, but we'll dig into those questions a bit later in this article). The reason I find her so fascinating and appealing is that she seems to have an extraordinary clear, non-attached, razor sharp mind combined with an unconditional loving approach to every everything and everybody. She fascinates me and intrigues me. 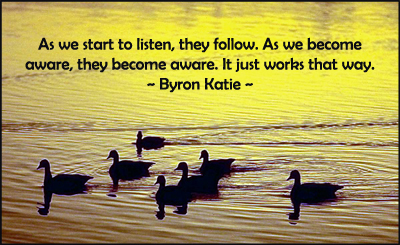 I've been following Byron Katie for some time now. I've watched many youtube videos with her and read most of her books ... and several of them, several times. I love the way each sentence is highly packed and condensed with meaning, thus you can't possibly get everything in just one read. Your mind simply isn't ready to take in everything in one go. So you have to read her words more than once. And I just love it, when I find a single sentence (that didn't have any particular impact when I read it the first time) but which now - because I am where I am - opens up the world to me and lets me experience myself and the world in a new way, in a new light. Oh my, that's heaven. So what do I get from listening to or reading Byron Katie? Well, that's a very good question. Several things happen all at once, I think. Overall I view her as a mirror of who I am, when I'm at total peace and in love (not infatuated, romantic love, but more like being love as an energy). It simply feels good inside when I listen to her and read her. And when does something feel good? I guess that's basically it! I can feel the truth of her words. That what she says is the nature of things. The way that things are. And I love that. I love understanding. I think we all know that feeling when something sounds so right; you feel free and at peace. That's what's she does to me. She's a clear, loving mouthpiece of my non-judgmental and all-accepting Self. And when I become that Self, I feel free. So what I get is that I get to learn about who I am. Or more precisely, I get to learn about who I am beyond my personality. Therefore I have also embarked on a journey to discover her parenting views simply because I wanted see if she could teach me something. I love to learn about new ways of being - being with myself, being with my thoughts and being with my son. They're all interconnected. 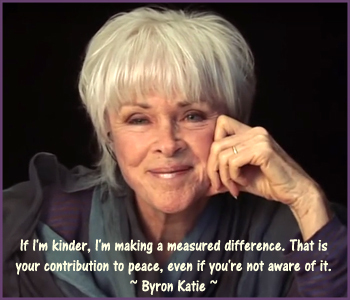 And Byron Katie has got something really nice going on, it seems. What is that? She seems to be in such nice place. What is that place? In this article about Byron Katie I wish to first present you with her fascinating life story along with her unique way of perceiving herself and the world. This will hopefully work as nice plateau to understand how she views parenting and her own role as a mother of three now grown-up children. Byron Kathleen Reid, known as Byron Katie or just Katie, was born in 1942 in Texas. Katie grew up like most Americans do - in a culture that celebrates the strong, successful, charming and beautiful. Byron Katie soon figured out this code for external happiness and spent the first 43 years of her life trying to live by it and become happy. The short story: It didn't work! At the age of 19 Byron Katie married her high school sweetheart, Robert. They moved in together and soon they had one ... two ... three ... children. They started doing business (real estate) together - something Byron Katie turned out to have quite a knack for. And very soon they were living the American dream. They were young, beautiful, married with children, had a huge house, lots of money, mingled with 'important' people and so on and so forth. What could possibly be wrong? Surely this is what everybody is dreaming about! Well, deep down Byron Katie wasn't happy. In fact she was depressed and felt empty and had felt like that for years underneath the success. To keep the emptiness at bay she would fill herself up with food and tobacco and escape through alcohol. As time went by, her 'successful' surface would crack more and more and out of confused frustration, she would react with aggressiveness and anger towards her family and paranoia towards the world. It is said that she even ended up having a loaded gun under her bed. In 1976 she divorced Robert and moved to Barstow, California, with her children and not a dime in her pocket. However, she soon met an old acquaintance, Paul, whom she married in 1979. With Paul she once again started on a real estate adventure and once again she was 'successful'. Soon they had lots of money and she was head back living the American surface dream. However, as much as Katie loved her husband and her children, she was still miserable. Now in her early thirties, Katie soon entered a state of deep depression and paranoia. She was afraid to leave the house and spent all her time tucked away, angry and afraid in her bedroom. Despite good efforts and support from Paul, there was nothing he could do to really help her. She was lost inside herself and angry to the point that her own children were afraid of her. For years Katie practically never left her bed. She did everything from there: eating tons of ice cream, drinking lots of alcohol and codeine pills but somehow still managing to make the occasional business phone call now and then. She would go for weeks without a bath and brushing her teeth and ended up weighing more than 200 pounds. With Katie 'hibernating' in the bedroom, Paul was left to take care of the house, the kids and doing lots of work to make ends meet. After several heart attacks, he was desperate and brought Katie to a halfway house for women with eating disorders. At the halfway house Katie was given a room in the attic all by herself, as her anger and frustration was making the other women afraid of her. I've also read somewhere that pots and pans were placed on the ladder / stairs to her room so that people would be warned by the sounds if she would come down. Katie was so full of self hatred that she didn't even consider herself worthy of sleeping in a bed. So she slept on the floor. - Awakening to a Life of Pure, Imperturbable Joy for no Reason Whatsoever! One morning in 1986 Katie woke up on the floor as she usually did. However, that was about the only thing that was usual about that morning. As she opened her eyes while lying on the floor, she watched a cockroach crawl over her foot. She looked around her room and everything was different. At the back of her head she knew what everything was by name, but still everything was new. New in her experience. She was seeing everything with a clean slate like a child. Everything was beautiful and felt miraculous. All she felt was complete joy and awe of life. In her experience there was no her as a person, no identity. She experienced the moment, the now, without identity. Without past or future or any man made labels. She could see the windows and through the windows she noticed there was a sky and inside there was a floor and walls. 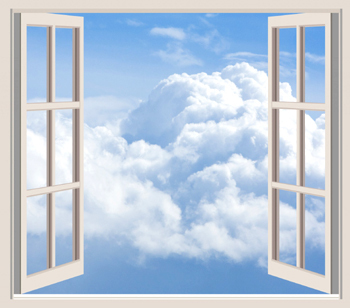 But what she saw in that moment was that before she would name it window or sky, they didn't exist. They were already gone again! The only reason they existed was because of memory: an image, a story, an identification. She realized that she had to leave the Now, before she could name it, and when she did, they became things of the past. And things of the past aren't real. They are just thoughts. And in that moment enquiry was born. Who she thought she was, was a construct of her mind. Now even though she had this very strong experience of just Being, thoughts did enter. Thoughts still came. However, the identification with thoughts was gone, so she describes her interaction with her thoughts like watching a movie. The thoughts are there, but they're not real. Even though Katie had changed profoundly, Paul and her children had not. So when Katie came back home her children didn't recognize who she was. They recognized her body, but not the person inside. The new Katie was peace. She was loving and fully living in and embracing every moment as if it was the most wonderful miraculous moment imaginable. To say the least, it was a shock to her family and not easy at all. Her children were afraid that all of a sudden this 'monster' that Katie had been would come back. However, eventually, the fear disappeared and trust grew. Encouraged by Katie, her children ended up telling her exactly how difficult and hard it had been having her as a mother. And Katie describes such sharing moments as fantastic because they were an opportunity to really connect. When her children were sharing their experiences, Katie learned. And learning, being the student, is something she would always prefer over being a teacher. Both because it is a lot more fun, as she says, but also because learning about someone's world connects you to him or her: "What is more intimate than people giving you their mind"
In the beginning it wasn't all that easy for Katie to live in the 'old' world. She would feel mad with love and go into the streets and start hugging people. She found it very difficult to put into words what she was experiencing and when she did, people couldn't understand it. However, little by little she would find a balance and just love people unconditionally and not expect anything from them. Realizing that thoughts are nothing but fiction and experiencing the peace in that realization started her famous journey of questioning thoughts. Contrary to many spiritual teachers who speak of letting go of thoughts, Katie advocates questioning them instead. She doesn't believe that you can let a thought go. A though lets go of you, when you've questioned it enough, she says. Katie says that her insight is extremely simple: She realized that when she believed her thoughts, she suffered, and when she didn't believe her thoughts, she didn't suffer. For years after her awakening she questioned her troubled thoughts, e.g. her children should pick up their socks. Is it true? Could she absolutely know it was true that they should pick up their socks? This constant questioning of the apparant truth of thoughts became the seed of what she now calls The Work. As mentioned, The Work is a very simple method and everybody can do it. All requires is pen, paper and an open mind. The method is used to identify thoughts that cause stress, fear, anxiety etc. When you've identified them, you start to question them. Are they true? And then, if you allow yourself to go really deep, you realize, they're not true. They are lying. And when you believe something that isn't true, you are fighting reality... that which IS. And fighting reality is a lost cause, always. And it hurts, always. So her method is helping you see the truth (that thoughts aren't real/true) and thus to set yourself free from their enticing, yet painful spell. Anyone that can sit still enough with these questions, can set themselves free. The mind created it all. It can certainly go back and find out what is true and what is not. The worst that can happen is that you come out with what you already have. It's not gonna get worse. After you've gone through the four questions, there is something Katie calls a 'turnaround'. The turnaround consists of turning a statement or judgment upside down and being quiet and listening to the truth that could lie in the opposite statements. 'My child should listen to me and not act out'. or 'My child shouldn't listen to me and should act out'. Sometimes a turnaround might not make complete sense, but Katie encourages people to really sit and meditate on them to see if there really isn't something they can use. For instance where is the truth in 'My child shouldn't listen to me and should act out'? Well, if what I'm saying is no good, then my child shouldn't listen. Clever child who feels the truth! And if what I'm saying is no good, then it is good that my child acts out. It's an opportunity for me to wake up. Once again, clever child, how blessed I am. In this way there could be a precious gem hidden in non-obvious turnarounds if you allow yourself to open up and be honest with yourself. Even though I've explored Byron Katie for a while now, she still often manages to surprise me with her unconditional love towards everything in herself and the world. What I find different about her compared to many spiritual teachers, is her unconditional love towards her ego and painful thoughts. She views her painful thoughts (even though they are very rarely present with her anymore) as her lost children. And she loves them. All of them. All they want is some attention and they will continue to beg you for it until you listen to what they have to say. And who would want to get rid of their own children? I absolutely love this way of embracing every single part of yourself. In this way there's no sense of inner separation. Your entire self is accepted and loved. And that in itself is healing. 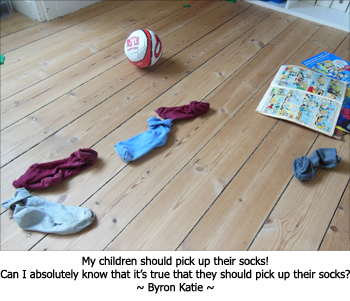 In the following I will present you with some of Byron Katie's parenting truths typically illustrated via one of her quotes. 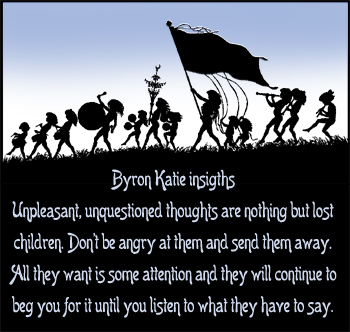 Most of the Byron Katie quotes below are original as I've gathered them myself from various youtube videos of Katie and some I've found in one of her books. Now, as I'm not in Katie's head, her thoughts are not my thoughts, obviously. So I can't know for sure what she means by her words. But I can guess. That the best I can do. So as all explanations go through my filter, they may be wrong. Or they may be right. We don't know. Only Katie does. However, no matter who said the words and what was meant by them, if they ring true to you, they ring true to you. And that's what's important. That's what matters, isn't it? To be and stay connected with the human being in front of you is one of Katie's all time biggies. As long as you're connected everything is good. It cannot not be. And Katie's secret is, that it's easier than you might think. Because it only takes ONE person! You can choose to be connected independently of the other person. Irrelevant of what that person does or believes. This is really good news because that means you've got all the power to create your own experience. Okay, this is all very well, you might think. But how do I connect? What does it mean exactly? Well, you know that moment when you're just completely present with your kid - there is no thought, no past, no future, just pure attention and love towards your child? That is connectedness. And how do you identify it? : It just feels so good. You just love. 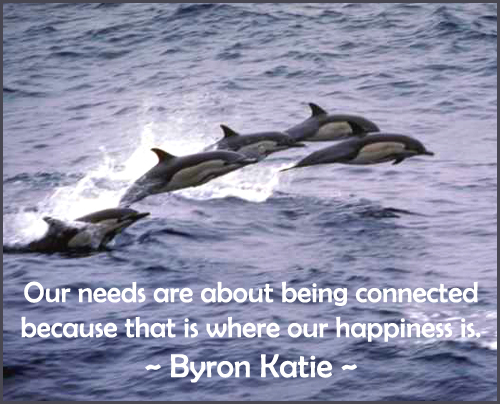 Our needs are about being connected because that is where our happiness is. Katie believes that any thoughts we may have about the past or the future (how things should be vs. how they are) create a sense separation with the person we're facing right now. In other words, the believed thoughts build a wall between me and my child. I can't see him anymore - the wall is blocking my view. What I see is only my fictitious image of him made up in my mind: How he should be and how he's not living up to that image. The way I'm perceiving my child - that is the child I'm going to react to. The problem is I'm not reacting to the child standing in front of me. When we put the past on that child, that's on us. So pay attention. Who are you seeing? Are you seeing a disobedient child throwing yet another tantrum (a story from the past with lots of labeling) or are you simply seeing a child crying because of something that is going on in his or her head? Which vision is 'cleanest' and most kind? Which one causes you (most) pain? Byron Katie says that when her kids reveal things to her, she sees it as an opportunity to visit their minds and go on a vacation in their experiences and she is immensely grateful for that. Having your children share their experiences with you may be the most intimate experience you can get. You get a little piece of their world and what a gift that is. When you remain open and grateful for EVERYTHING that is being told, your children will most likely love coming to you regardless of what they have to say. Because it makes them feels good. They get to connect with you and thus themselves which feels good. Simple! I can't offer advice, I can offer experience. This is probably a very provocative statement for many parents. And understandably so. We see ourselves as better knowing vis-à-vis our children because we know more of the ways of the world and have experienced more. So of course we should know what's best. But do we really? Do we dare to even question that assumption? Uh, that's scary territory, indeed. Can we be sure that what we say is the best thing for our child? Can we really know? I mean, really, really know? But then what? We can't just stop talking to our children. Surely that would make them feel insecure and afraid. Well, how about honesty? How about admitting that you actually don't know but that you can see that there are several options or that you've tried this or that which worked or didn't work? What effect may this have on your child? Well, I can only speak for myself but by now my son of eight is pretty used to my saying: "I don't know!" But I never just leave it that. I explain why I can't know it; what the 'knowing' requires and why it is not within my grasp. This gives him a picture of how things interrelate rather than a fixed (fictional) picture of how things are. I can choose to give him options to believe if I see any, but I stress that they only possibilities and that I cannot know if they are true. And if his question is about him, I encourage him to find out for himself. Today, when my children ask me what they should do, I say, "I don't know, honey." Or, "Here's what I did in a similar situation, and it worked for me. And you can always know that I'm here to listen and that I'm always going to love you, whatever decision you make. You'll know what to do. And also sweetheart, you can't do it wrong. I promise you that." I finally learned to tell my children the truth. We all know that strong impulse: your child has done something you view as 'bad' and you just can't resist telling him or her that it was wrong or not good: "Oh no, you spilled your spaghetti on the wooden floor, now there's going to be a stain." or "Excluding your friend from the game wasn't a very nice thing to do". It's like a reflex, we just blurt something out that tells your child that it wasn't a good thing to do. We can't resist the blaming because the experience is so wrong in our heads, that we don't want to ever experience it again. So this is about our experience, not our child's. WE don't want to experience it again. But does it work telling our children off? That what they did was wrong? Well, I think our children are smarter than that. They already KNOW, don't they? So what does our telling them off give them other than guilt and feeling bad about themselves? Not much! I'm always preaching to the choir, when I'm coming at my child [they already know what is right and wrong]. Okay, you may say; how can I be sure whether my child knows if what he has done is good or bad? What I do if I would like my child to reflect on a certain thing, is that I talk with with my child about how he experienced the event in question. How did it make him feel? Did it feel good or not good? Why could that be? In this way, he empowers himself by finding his own answers, even if a part of him doesn't like the answers. We are all empowered when we find our own truths. - Problems Are Always About Me, Not My Children! And What a Relief! Whenever there's a problem in my house, I look to me and that is so empowering because no one has to change other than me. This way of viewing problems may seem very provocative. Surely, everything cannot be about me? Well, I guess it's a question of perspective and of how you ultimately want to feel. Do you want to feel victimized and subject to everybody's whims and moods or do you want to feel empowered? If you decide that all feelings are your responsibility, then it will always be you that can do something about them. This way of viewing it may at first seem unreasonable or unfair because everything then seems to falls back on you. BUT in reality it's also a recipe for empowerment and freedom. You are in charge. You decide everything about yourself ... from the inside. Isn't that amazing? That's what a change in perspective can do. 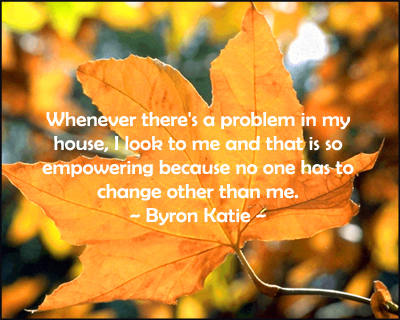 In the below quote, Byron Katie, states that she is always the cause of separation between herself and her children. I'm the cause of any separation with my children or grandchildren and knowing that is such a relief because it's something I know how to deal with now. I put my mind on paper and I question it. And the mind I put on paper are the thoughts that separate me from my family. You may now have a question; for instance, how can I be a cause of separation if the kids start it? Well, it doesn't matter who start it, you feel it. You feel an emotional separation from your kids. And when you feel it, you've got to own it, if you want to bond and connect again. 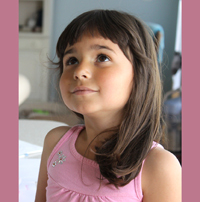 Have you noticed that looking at your child is like looking at yourself? Children come to us clean, pure, observant and eager to learn. They're simply wired like that. And oh my, do they learn. We cannot begin to grasp how much they learn from us. And only a small, teeny weeny percentage of that is intentional from our part. All the other stuff is mostly unintentional and comprise of them copying and taking on our affective behavior, emotional reactions, aggressive or withdrawing energies etc. In other words, children are so smart. No matter what, we can't hide how we really feel about ourselves. Our children may not know it mentally or rationally but they know it emotionally or intuitively. As you exhibit your growth, your child can only grow. As we start to listen, they follow. As we become aware, they become aware. It just works that way. Our children mirror back to us ourselves. If I'm in resistance, my child learns that the way to deal with life is to resist. [Children] are so smart until we teach them fear. What we believe, they will take on. It's very tempting to think that our children are like small extensions of ourselves that we can control and manage to our liking. I think when we're not aware of it, we all do that now and then. But most often it is also the cause of a lot of frustration, because our children do what they do (when we're not looking). They what they think (regardless of us looking or not). In other words, their are their own. They belong to them. This insight may seem banal but emotionally, it's fairly revolutionary and liberating, too. We can do our best as parents but ultimately, it's not up to us. Our children have their own path. We can support them and love them, but their life is up to them. 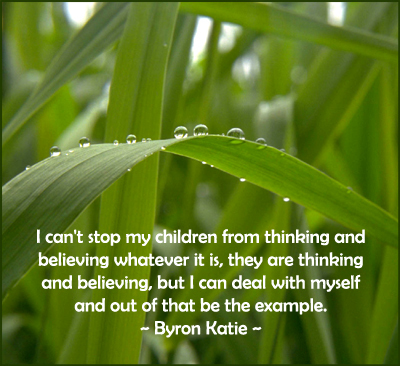 I can't stop my children from thinking and believing whatever it is, they are thinking and believing, but I can deal with myself and out of that be the example. There are two ways to witness your child [when they throw tantrums] one is in peace and one is not. Either way, the child is doing what she does. [...] Eventually she'll notice that there is peace over there in you and eventually her mind will shift. I can't pretend to be present for my children. I really have to be present. [...] they're smarter than I am. 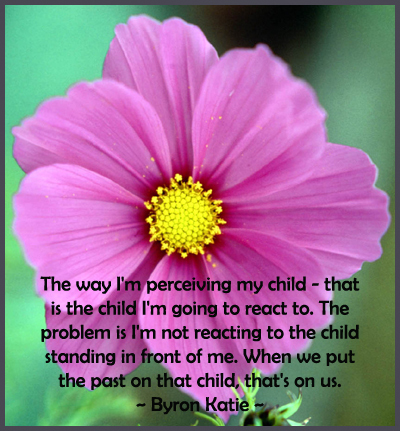 Below you'll see a video where Byron Katie does The Work with a mother who has a son with OCD. Here she helps the mother to see that we can never change what another persons feels and thinks but we can always change how we view the whole situation: "Your son believes what he believes and you can't stop him. But you can work on your own mind". I hope you enjoyed this rather long read. I surely enjoyed writing it. 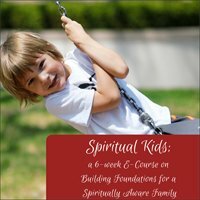 Spiritual Courses: My Review of a 6 Week E-Course for Spiritually Aware Parents and Their Kids. 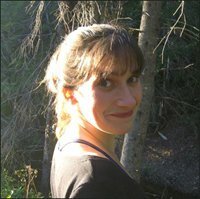 An in-depth interview with spiritually aware parent coach Christina Fletcher. The Simplest, Yet Most Powerful Parenting Tools: Conscious Loving and Teaching Kindness. 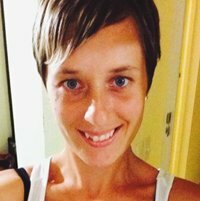 A parenting interview with kindness catalyst Kylie Riordan.